Despite chronic lower back problems, Kevin Sheary persevered through a tremendous pitching career for the powerhouse Hurricanes of the mid-1980s. The Flanders, New Jersey native was drafted by the Milwaukee Brewers out of high school but chose to be a Hurricane instead. A good thing too, since Sheary won 10 games his freshman year, a UM record he shared for 15 seasons. 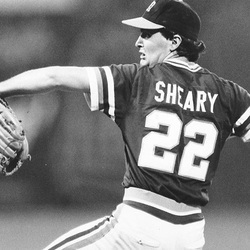 A four-year letter winner (1983-1987), Sheary's many career highlights include winning all three of his starts at the 1985 College World Series. Sheary beat Stanford, Oklahoma, and then Texas in the championship game, giving UM its second baseball National Championship in four years. Simply put, the team dubbed "America's Happiest" in 1985 wouldn't have won the national championship without Sheary's steely performances on the mound. For his success that year Sheary was named to the College World Series all tournament team, and was again drafted, this time by the St. Louis Cardinals. After more back problems in 1986 Sheary came back for his senior season, saving the best for last. Not only did he lead the team in wins once again, he did something that no other Hurricane has accomplished before or since: Kevin Sheary pitched a perfect game. On March 14, 1987, Sheary threw 102 pitches against Southern Illinois, striking out 12 batters as the Salukis were completely shut down. With one lucky bounce, a ball hit off Sheary's foot in the ninth, the runner was thrown out at first and Sheary and the 'Canes won, 7-0. Now living in Seminole, Florida, and involved with several businesses, Sheary earned a Bachelor's degree in Communications from the University of Miami in 1998.